It's Saturday, woooooo hooooooo! (Well, it was Saturday when I started this post!) Saturday morning is the best part of the weekend if you ask me - you have no worries, can finally relax and enjoy a nice cup of coffee knowing that you have the whole weekend ahead of you. This Saturday I woke up at 8 am. What should I do before going to work at 1 pm? Go to the Farmer's Market, of course! I'd been meaning to go for at least a year now. 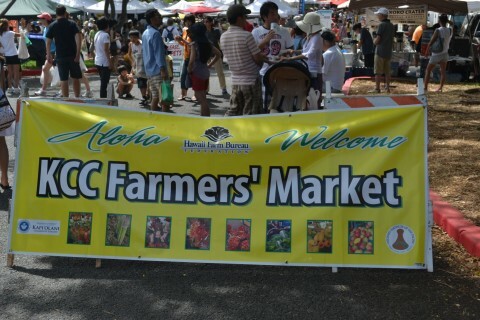 The particular Farmer's Market I had in mind (at KCC - Kapiolani Community College) opens very early in the morning and closes at 11 am. I felt a little ridiculous carrying my DSLR camra bag across my body, a reusable bag (stocked with ice packs) on my shoulder, and the camera around my neck. I'm usually willing to look crazy in order to get good food photos, but sometimes I get a little self conscious. 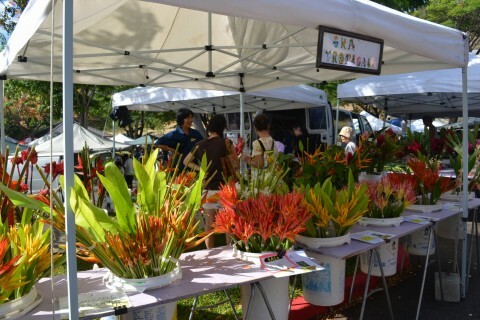 Once I arrived and saw the madness of the Farmer's Market, I realized that I fit right in, obnoxious camera and all! It was so much bigger and more crowded than I ever dreamed it would be! Half of the people there were tourists from Japan, brought by trolly from Waikiki, complete with huge visors, cameras, and video cameras! I had nothing to worry about. You're welcomed to the Farmer's Market with this sign, WELCOME! A long line of people caught my eye as soon as arrived. Did I have to get in the line for some reason? Was that for the porta potty!? What are you all waiting for? 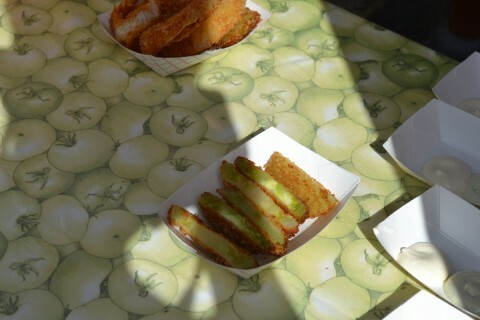 I snuck up to the front and saw that the main attraction, which I never expected, was fried green tomatoes! I've never seen the movie Fried Green Tomatoes and I've never eaten one either. I'm fairly certain that they are extinct (or at least endangered) here in Hawaii. Perhaps that's why the line was so long! What part of the country/world do Fried Green Tomatoes call home? Green tomatoes are so strange looking. Is that where green ketchup comes from? 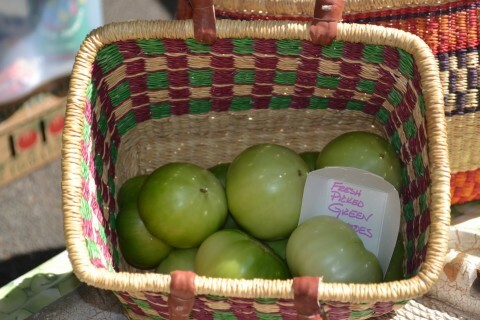 Even the tablecloth was green tomatoes, how cute! 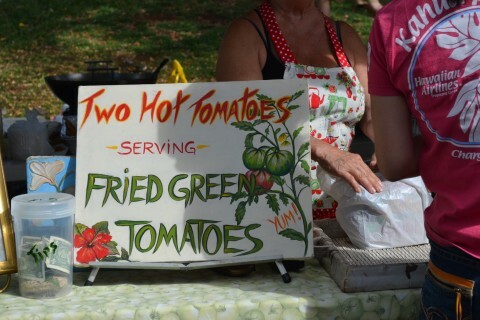 Here are the real deal Fried Green Tomatoes. Excuse my terrible photography skills please. The sauces to the right are a basil mayonnaise and a lemon wasabi mayonnaise. I ended up waiting in the line eventually and got the combination - all 3 of the offerings - fried green tomatoes, zucchini, and onion rings. To be honest, I'm not a big fan of fried green tomatoes! 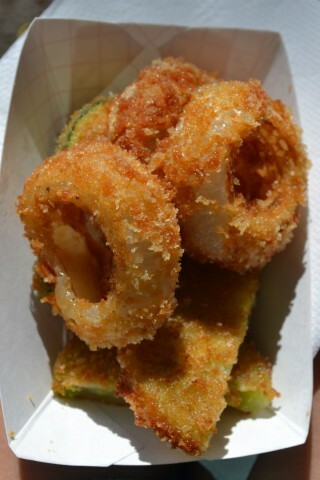 I loved the zucchini, thought the onion rings were good, and the tomatoes were last on the flavor scale, sadly. The lemon mayonnaise was so surprisingly good, adding to the joy of indulging in fatty fried food at 10 am! 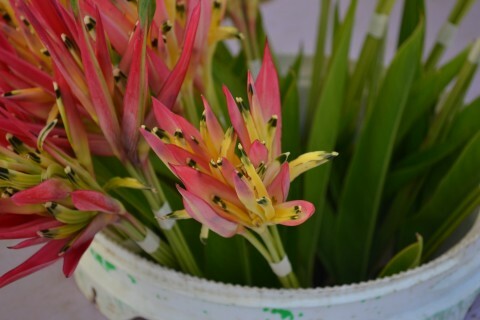 As you'd expect at all Farmers Markets, there were plenty of beautiful flowers. The flowers here in Hawaii are so exotic and unique! So many varieties of fruit and vegetables were up for grabs. Many of which I've only ever seen in Hawaii. Like dragon fruit, which I've yet to try. How do you cut, serve, or eat that? I just googled it and found out that dragon fruit is from a cactus! Little cucumbers shaped like hearts and stars - how did they do that?! I bet kids would eat more veggies if they were all that cute. Check out this "Baja Style" mango on a stick! How clever. These look cute but would never actually be cut or eaten that way, since you don't eat the seeds! Bamboo shoots! I asked the people at the market what you'd do with a bamboo shoot and they said "make curry or soup!" Tatsoi (?? ), ginger, and choi sum - among many other green veggies. So, so many colorful tomatoes! Carbs - in the form of many types of bread. Green waffles called "pan dan waffles" - green waffles and ham?! Purple taro rolls, yum! Taro is big in Hawaii and is most widely known for being the main ingredient in poi. Live abalone from the Big Island - gross! And beautiful abalone shells. 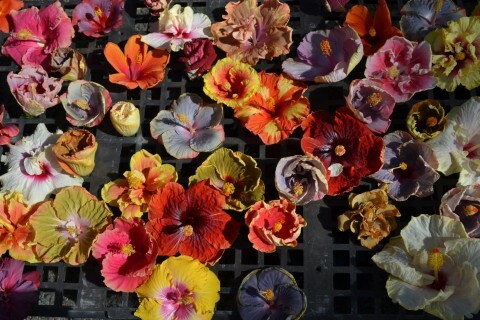 Note: these can be used as a tray for wasabi! Pizza! They have the tomato tablecloths too, so trendy. And these donuts - I have no idea what they're made of! Some fried rolls - chicken & veggie, shrimp, and banana. Sausages on a stick - how random! That big guy can't wait to eat a sausage on a stick at 10 am. Whole macadamia nuts - which I've never actually seen before. But wait, if you buy them now you can get this adorable little mac nut cracker, too! The larger, wooden contraption on the right is what cost $90! A mile long line for shave ice. It's still morning, people! And finally, one of the most popular items of the day was a whole coconut drink. This guy was hard at work chopping the coconuts just right with a giant knife! Overall, the KCC Farmer's Market is wonderful! I'll be going back frequently for sure. I'll post soon about what I bought, and made, from the market!